Tenda a quick popular brand name for networking and wireless product for the home to the commercial range. I always posted popular Tenda router configuration and setup, like Tenda N301, Tenda VDSL modem and many more. In this post, I will cover a complete and easy configuration guide for Tenda O6 5Ghz CPE point to point configuration. Before start configuration, I will be given a brief product description about Tenda O6 11Ac 433 Mbps Cpe device. Get user manual for Tenda point to point and point to multipoint also. Tenda 06 5GHz 11AC 433Mbps Outdoor CPE Specification. Tenda O6 5Ghz is a 433Mbps Outdoor CPE for wireless point to point and point to multipoint connectivity. O6 5GHz CPE best for CCTV camera and internet and DATA connectivity between two locations. Tenda O6 having 16 dBi directional antenna to long-range connectivity up to 10 km as per Tenda official datasheet. 1Gigabit WAN/LAN Poe port give you up to 433 Mbps wireless speed. Tenda O6 5Ghz CPE support multi-mode, Access Point mode, Repeater mode, WISP mode, Client mode and Bridge mode to use as per requirement. Where can you use Tenda O6 5GHz CPE? Tenda O6 support 5 GHz band so it can use multi-service type work. If you are looking for wireless connectivity for your CCTV project to convert your IP camera into the wireless camera than this device can be used. If you are an ISP and looking for 5 GHz CPE to provide internet connection to end client than Tenda O6 can be used. Wireless point to point and point to multipoint important connectivity type for long distance where physical cable laying not possible. Tenda 5GHz CPE best fit for your point to point and point to multipoint connectivity for the smart city as well as rural broadband projects. How to setup Tenda O6 5 GHz CPE Point to Point? To configuration of Tenda O6, 5 GHz CPE required some pre-requirement configuration for desktop and Laptop to get access device in the web browser. First, configure your Desktop and Laptop with Same series IP Address of Tenda Default IP. For point to point configuration required 2 device one for Local side and second for remote side. So keep ready your both devices. Tenda O6 Client mode configuration for Remote side. Tenda O6 5.8 GHz 11 AC 433 Mbps Outdoor Long Range Default settings. To configure any device default settings required to access it in the web browser and command line. If you are going to setup first time Tenda O6 5 GHz for PTP and PTM. You can get the default setting back side sticker of your Tenda device. See the Ethernet and double-click to go properties. Go to TCP/IP4 and use Static IP address with 192.168.2.2 or 3,4, 5 anyone. Click ok and close to confirming settings. Tenda O6 and O3 5Ghz CPE Login First time. This configuration guide supports both model Tenda O6 and Tenda O3 5 GHz CPE. The diffrence is only Tenda O6 support up to the 10Km distance and Tenda O3 support up to 5KM distance as per claim by Tenda official website. Tenda O6 and O3 5GHz CPE Network Connection Diagram. To login Tenda CPE you must connect proper physical connection to get access to Tenda web interface. See the connection diagram below. 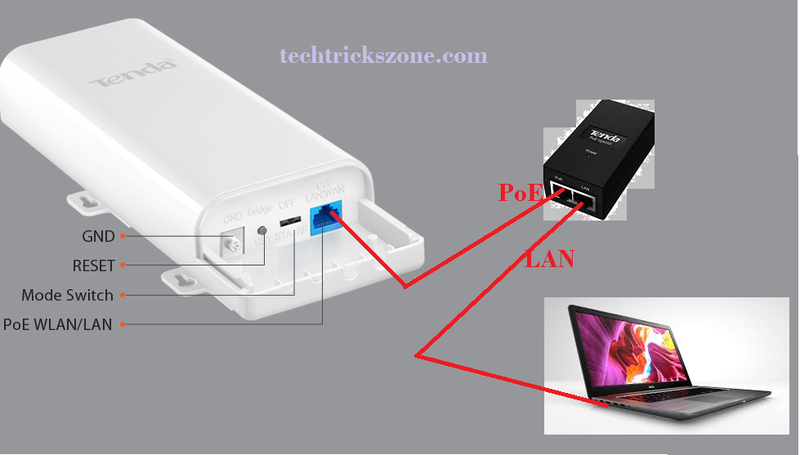 Connect Adapter PoE port to Tenda LAN port and PoE LAN port to Laptop/Desktop Lan port as follow below image. Now Open the Web browsers such as internet explorer, Firefox Mozilla, Google Chrome and type 192.168.2.1 to URL bar and hit enter. 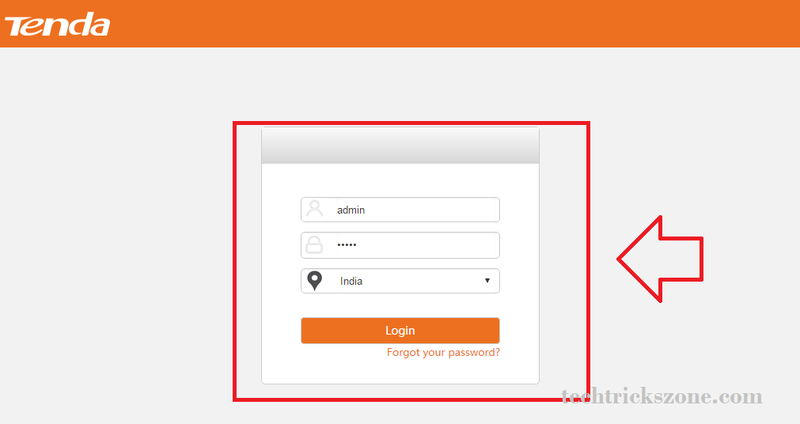 Login with admin/ admin default username and password. Tenda O6 and Tenda O3 5 GHZ AP Mode Configuration for Site A. As describe already there is two site required for point to point configuration so first, we will configure Access Point mode for site A.
Tenda O6 and Tenda O3 5 GHz CPE Mode Settings. For point to point configuration first setting have to do is wireless mode settings. Configure the first device as AP mode and second as a Client mode. Go to Quick Setup – choose AP mode and click Next. WI-FI password- type password in this box and click next for next steps. To confirm the AP mode setting click save buttons. Note—as already told your for point to point and multipoint more than one device use so don’t forget to change both side LAN IP address to avoid network conflict. You can use the next IP of same series for second side device. EXP- Site A side 192.168.2.1 than remote side can be 192.168.2.2. Tenda O6 / Tenda O3 LAN IP Configuration. Subnet mask- as per IP series. Device Name- you can change device name as location name to quickly identify your device when you access from the remote side. Tenda O6/ Tenda O3 5Ghz Client Mode Configuration for Remote Site. After AP mode configuration now needs to configure client mode for remote side device.to configuration of client end device follow the above steps for connection diagram and login details. After Login please follow the steps Tenda O6 LAN IP configuration first to change client device IP address. 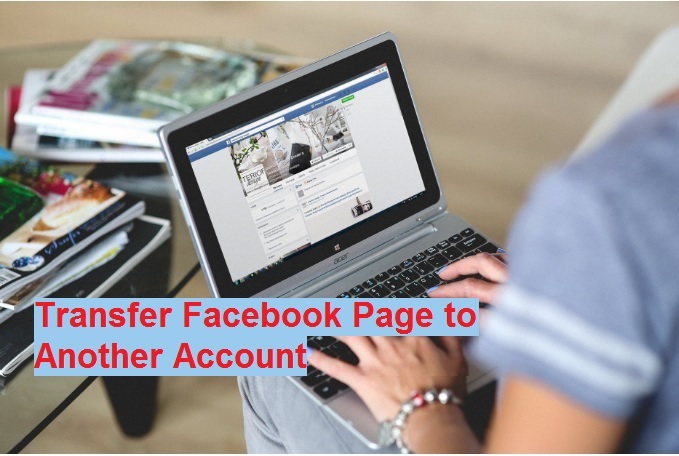 login with new changed IP address and change mode to client mode first. Quick Setup – Station mode chooses and click next steps. In next step, you get Scan button to find your AP device name as configure by you. Channel and Security type will auto-detected from AP settings. Please do not change Channel. Type password in Key box to confirm the connection with AP mode device. Click Next button to save settings. 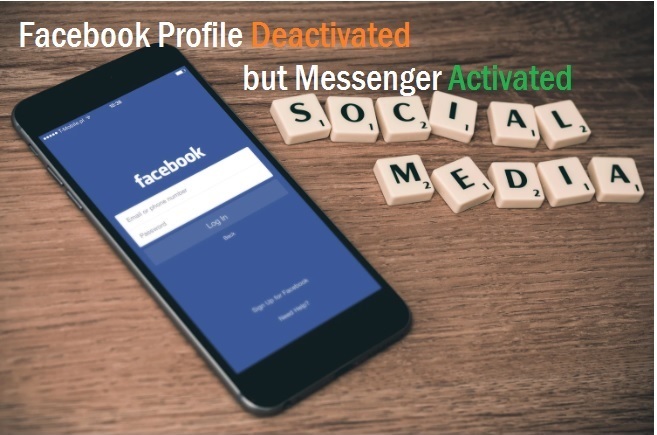 After rebooting and save setting you can check the Status page to connected status and signal strength for same device. Tenda O6/ Tenda O3 5Ghz Point to Multi point Configuration. 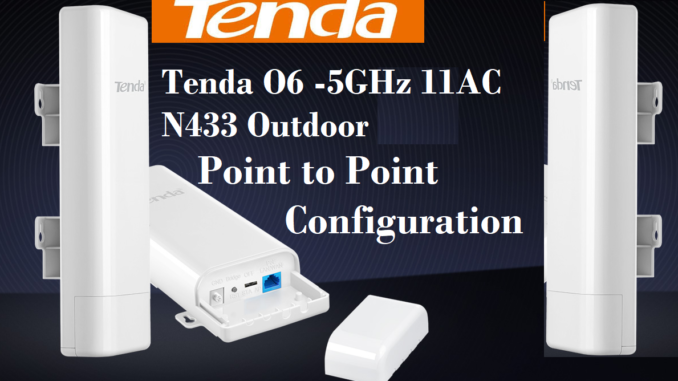 To configure Tenda point to multipoint mode AP device configuration will be same. To multipoint connectivity repeat the client mode configuration for multi-device you want to configure with AP device. Example – if you have 3 different location and you want to connect point to multipoint than follow steps. Again configure the Tenda O6 or O3 CPE with client mode for location C and more. How to Factory reset Tenda 06 5GHz 11AC 433Mbps Outdoor CPE. There are some important maintenance and administrator settings required in every wireless router and device. See if you forgot IP username or password for Tenda Wireless router than how you can reset it. Reset to factory reset– If you want to factory reset device use this option. Upgrade firmware – Tenda o6 and tenda o3 upgrade the latest firmware with this option. 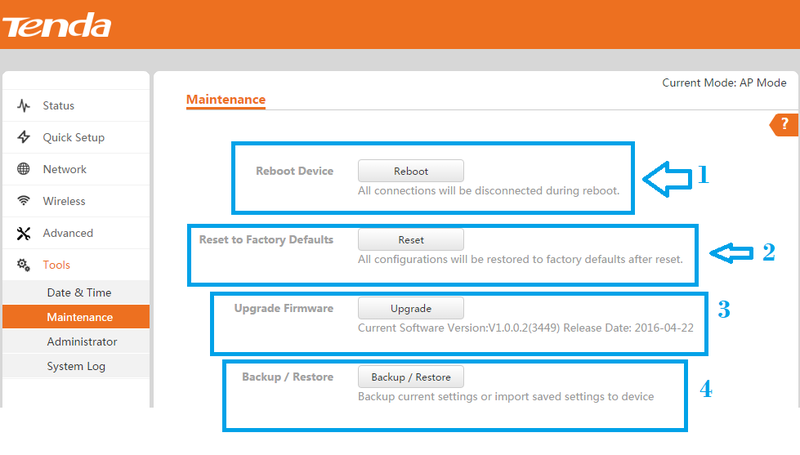 Backup and restore– After configuration of Tenda router, you can save the configuration file for future configuration in case you required Tenda device factory reset. This is basic steps to configure pint to point and point to multi point for tenda 5GHz CPE device. but this steps you can also follow for any other brand radio to the configuration. 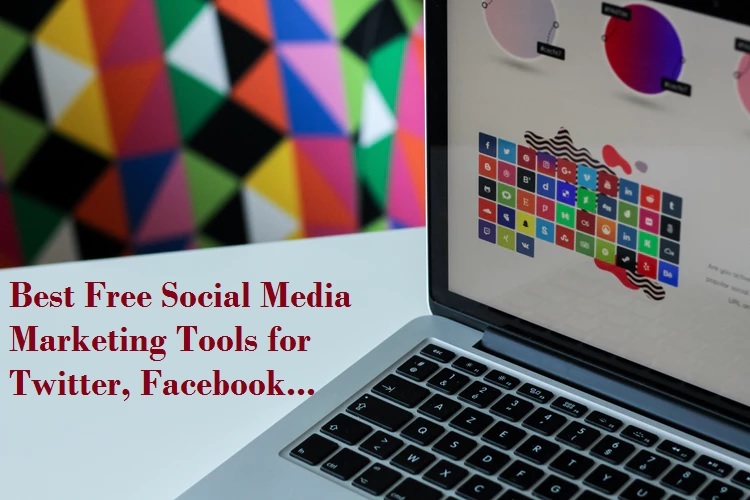 please comments and send mail us if you have the question related to this tutorials.